Cooking lunch or dinner in the open air has its peculiarities – only food, company and beautiful nature aren’t always enough. The barbecue season is coming. That’s the time when the weather gives us warm evenings, suitable to have a snack out in the open air, gather with friends and family around the garden BBQ. Many people are too naïve to think that for a single successful barbecue you need only delicious meat, cheerful company, wine and guitars. It’s partially true, but those ingredients don’t exhaust the list at all. The truly delicious barbecue comes only when you use appropriate wood, high quality meat and you follow the right cooking technology. What’s more, your barbecue has to be in tip-top condition. It probably sat in a dusty place all the winter, so now that you take it out, you’ll have to give it a good deep clean. In general, keeping the BBQ grill shiny will guarantee flavourful meals, no mixing of tastes, no burnt deposits messing with the quality of the food and, of course, less mess. Now who wouldn’t want to cook in a clean environment? It’s best to use wood for the good barbecue. You could use coal, but they will have to burn for a long time and will have to have a pleasant smell when smoking. Those coals are a rarity. Do not tempt to burn old fence laths or dyed wood from disassembled furniture. It’s not recommended to use perch or elk trees – normally they contain resin which could cause a bitter taste and unpleasant smell of your meal. The ideal option is to use apple, cherry or pear wood. The old orchard wood pulp gives the meat a distinctive and very pleasant flavour. Beech and oak are also a good option. Some chefs recommend using barbecue that allows for placing the meat at 10 cm over the embers. If it is placed directly on top, there’s a high chance for the meat to burn too fast, but if it is too far from the fire it may just as well remain dry and uncooked. Avoid buying already marinated meats, whatever the kind. Sometimes the meat they marinade could be already thawed and tasteless. The best meat for the grill should be fresh, not frozen, preferably from young cattle. In May, you can find plenty of lamb, veal or pork meat on the store shelves, while for the rest of the year bet on chicken or even fish. 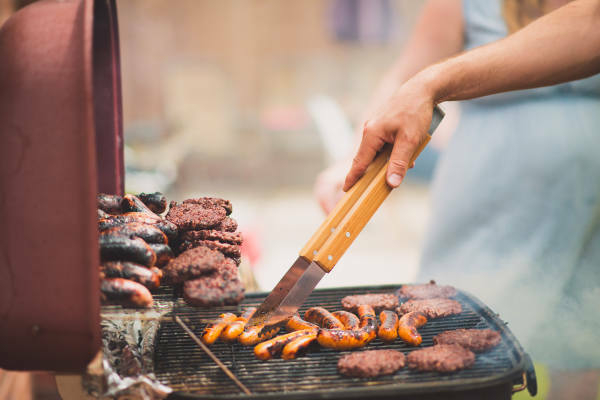 When you pick the barbecue meat, you have to be in the clear about one fact – some kinds of meat are “easier” while others are “more difficult” to cook. Specialists explain that the veal meat is the most dangerous for the beginners, since its cooking is a bit harder. If you leave it a touch too long on the grill, it might easily turn dry and tasteless. We recommend for the ones who don’t have enough barbecue experience to had better handle pork, lamb, fish or chicken. The culinary enthusiast usually make one and the same big mistake just after buying the meat. They marinade it in different self-made recipes – vinegar, wine, lemon juice or yoghurt. The experts think that if the meat is young and of high quality, marinade is not necessary. Instead, you can season the meat with salt, black pepper and onion. The main idea here is that it’s important to have fresh food, while the marinade and the excessive usage of spices only put off the natural meat taste and smell. If you decide to cook barbecue with older piece of chicken after all, you can dip the pieces in mineral water and a glass of cognac. The biggest mistake you could ever do with a marinade for the grill is drowning the meat in yoghurt. The diary products not only change the taste of the meat completely, but they leave a layer which burns quickly on the fire, while the meat itself doesn’t grill equally. If you cook meat on skewers, place the skewers themselves on the grill for around 5 minutes. By heating them, the skewers won’t will help preserve the meat juices. What’s the right moment to start grilling the meat? You can guess by the bright red colour of the ambers that they are ready to bake your steaks. If their colour is grey, the meat will darken and won’t look as appetizing. It’s recommended to gather the meat at one spot – do not spread it around the whole barbecue. Another valuable practical piece of advice is to not use water to put off the barbecue flames. The water will reduce the fire, but will also create conditions for the meat to grill unevenly. While the grilled skewers fill your mouth with saliva, it’s time to lay the table. Green fresh vegetables, red wine, a loaf of bread – that’s the best garnish for the ready barbecue.